By Zhang. Posted 2010-03-26 at 22:33. Filed under Electronica and tagged China. Permalink. Subscribe to this post’s comments. Both comments and trackbacks are currently closed. Through ths post, you will find some fucked up things in China, mostly around with netlabel’s community and by my personal experience. I have no power to changed those things fastly, and i can’t expect that will be really changed as well. But i must have a talk. 7  219.158.4.222  reports: Destination host unreachable. Also as you did know, very much netlabel’s sites and netaudio lover’s blogs are hosted on blogspot.com, but what it happend in China? Seems not bad for blogger isn’t it? But what if i type any blogspot site URLs to firefox and press. Why that happend? You may now have the question. Ok now. 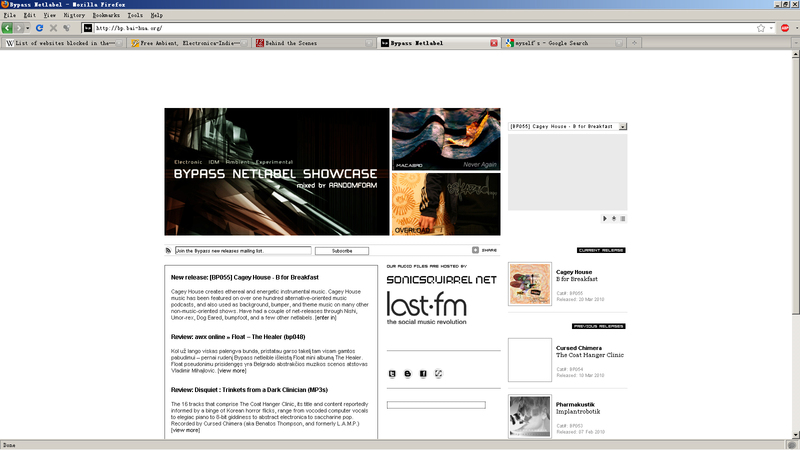 What if i going to myself’s Bypass Netlabel’s site at my home? Why even myself’s site got a blocked? Two reasons at there: First, our site were hosted in the U.S. area. Second, the “XSPF player” which the Bypass’s site used had a HTTP request to the PHP program http://www.archive.org/audio/xspf-maker.php, which i use it to automatic generating XSPF playlists. So the result is: Golden Shield detected a HTTP request from Bypass site to an unallowed site – archive.org, then, block it immediately. fast and stronger, without any notices. That’s what happend in China. Everyday Chinese people’s Internet activity under the control of Golden Shield Project, with stringent surveillance and freedom limited. If you try to type a keyword “BBC news” on google.com and trying to visit the results, well then yours google access will be blocking immediately. If you got the informations above at there, you may now realize why there’s no Chinese netlabel. 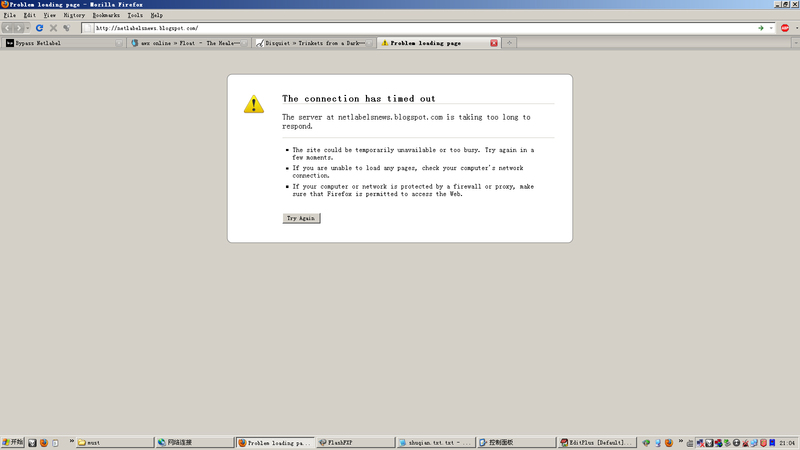 Well, I running a Chinese netlabel, but Chinese people can not even accessing it. Is this should be happend in a civilized place? How do i keep working under the fucked? I have pay for a commercial VPN account with $59.99/year, to keep the Bypass Netlabel’s daily running, it allow me to visiting Internet Archive, Facebook, Twitter and such things. But perhaps one day the commercial VPN server will be blocked as well. 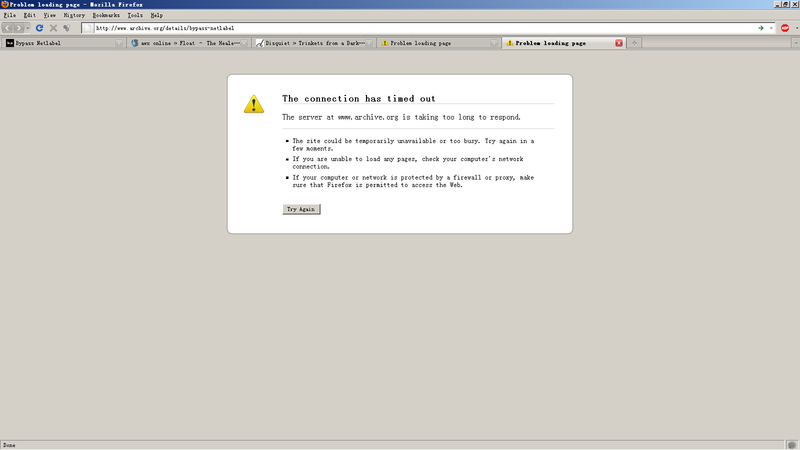 Presently, almost all free VPNs internet server already got blocked by Chinese government. That included Hotspot shield, CyberGhost, JAP, IFree VPN, and almost all proxy servers. Well, that exactly is what i will going to do.